Fresh fruit makes a colorful, juicy and delicious treat. 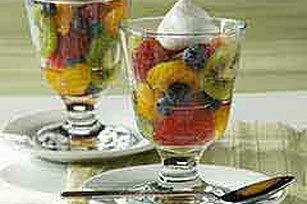 Top this easy medley with whipped topping, and you may forget it's a Healthy Living recipe! Toss fruit with reserved orange liquid. Spoon evenly into 6 individual serving bowls; top each with 2 Tbsp. of the whipped topping.